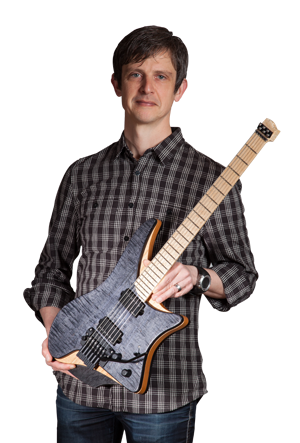 It is time that I create an instrument to show off the designs. Not being quite ready to take on the EGS work, I have decided on an alternate course of action. I purchased a throw away Squire Strat that had been kept for spares from 4Sound in Uppsala and I will document the work of converting this into using the EGS tremolo here on the blog in a series of installments. The guitar itself. I didn’t get any hardware at all for it, but will sort that out later. 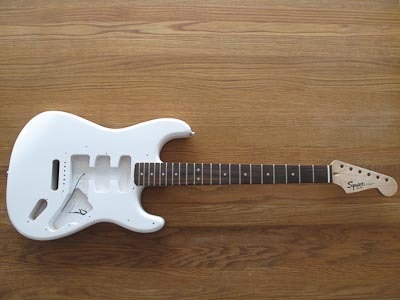 Here, I have put some masking tape on the guitar to be able to draw on it and mark out the position of the new tremolo. I have also drawn a line at the 25″ position from the nut and traced something resembling where the saddles should be positioned. 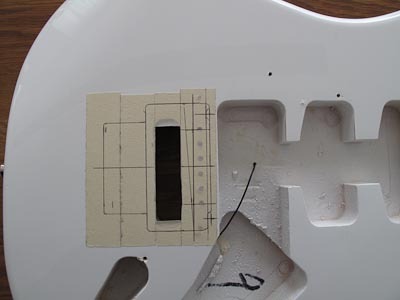 Here, I have marked the positions for the tremolo posts 74 mm apart and also traced the outline of the tremolo base plate on the masking tape. 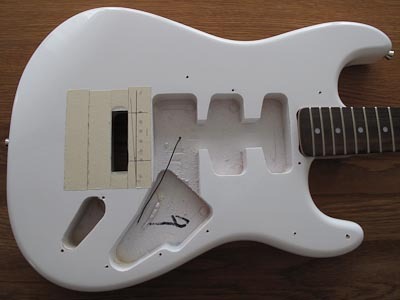 Next installment will take you through drilling the holes for the mounting posts and routing the clearance behind the cavity to allow for tuning.